(Hopefully) losing weight on a bike! A former colleague has signed up as a Sky Ride leader in the Richmond area, and although it’s not my patch I thought I’d look into what else they were doing in my little corner of the work on the Kent/Surrey border – frankly there’s not much organised cycling around my way, it all comes from Dulwich/Hayes and down the Downs. It turns out that there’s a few sky rides in my area, with two starting at the end of my road, and one starting at the bike shop I bought the GT from – Bigg-In Bikes (aka http://www.woollyhatshop.com/ online), which actually covers a ride I used to do of an evening last summer. This one is on the 15th July, but at 17 miles might be a bit too much to attempt so soon. I quite like the look of the 29 mile ride at the beginning of September though, which is around Sevenoaks, maybe 10 miles east of me. 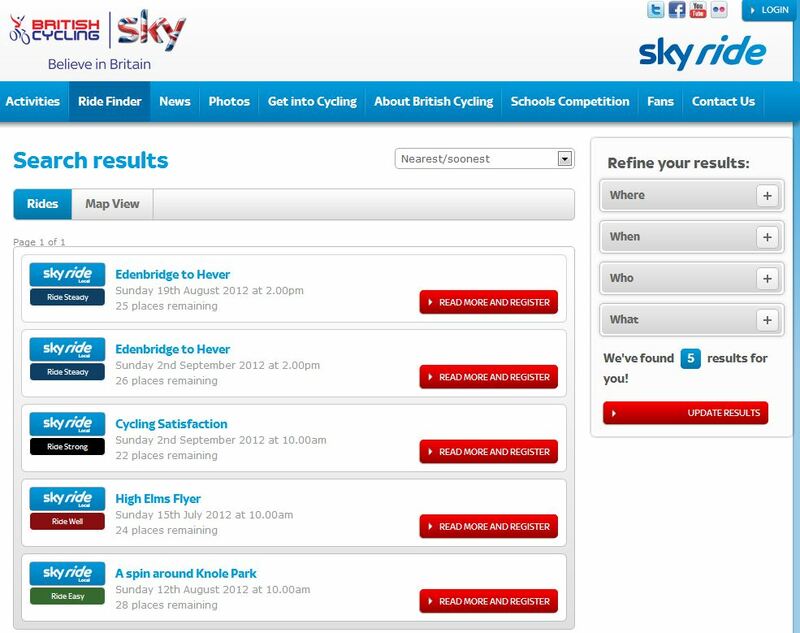 Here they are – to look for rides in your own area look at http://www.goskyride.com and if anyone fancies the Cycling satisfaction ride on 2nd September leave me a comment and let’s try and meet up.